Get our regular newsletter delivered straight to your inbox for up to the minute news about what's happening. Sign Up Now! “Our lost sheep are coming home.” I turned and said to Brenda after a jaw-dropping meeting with one of our youth who we hadn’t seen in over a year. Jesus said, “My sheep listen to my voice; I know them, and they follow me.” (John 10:27 NIV) Recently, we have seen those words come to life before our eyes. The Holy Spirit continues to work in the life of the true believer even when they have strayed from God’s path. “Even when I denied God completely, something kept telling me to go back,” said one youth. “It was like I just suddenly woke up from a bad dream and could see clearly again,” said another. “One morning, I realized that I can’t just be like everyone else who lives like God doesn’t exist,” confessed another young man. When a sheep gets lost in the wilderness, it comes back carrying the consequences. 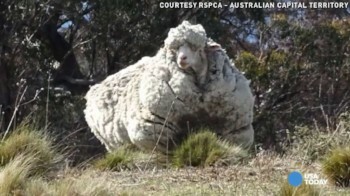 A sheep dubbed “Chris” was found wandering the Australian wilderness in 2015. He could barely walk from the weight of the accumulated wool which, when shorn, broke a world record at 89 pounds! The cost of running away from home can be very high. For some, it means learning to be a single parent. For others, suffering the consequences of abortion. For all of them, the emotional scars of failed relationships, uncertain futures and lost testimony weigh heavily. Over the past two years, seven of our teens who graduated High School suddenly chose a life of sin and rebellion. In the past two months, four have just as dramatically returned as repentant “prodigal sons” seeking forgiveness and restoration. The healing process has begun for them. They have been forgiven of their sins through their repentance and confession (1 John 1:9), but their restoration and recovery will take a long time. Your prayers for them are being answered. Please continue to pray for the three young adults who are still choosing rebellion over redemption. Please pray for wise words as we counsel the returning wounded, as well as warn the next generation of teens of the dangers of falling away. We sometimes have little faith for the restoration of those who are lost, but we are learning that God is the Good Shepherd and he takes good care of His sheep. One of the biggest ideas at Crossworld is that God can use people of all professions to reach the world for Christ. God uses all of your talents and abilities for His glory. In Cayambe, photography has been one of the primary avenues for reaching new people and building relationships. We are also using photography to make a contribution to community development. Recently, a neighboring rural community renovated and reopened a tourist attraction from the 1930’s called “El Tingo”. We’ve been able to get involved by producing promotional photos that they will use online and in print to promote the site. Recently, Dave was able to do a photo session with some friends who were once part of the Tourism Club. They needed some promotional photos of their new professional training center. Many small businesses and rural communities don’t have the knowledge or the resources to produce this material on their own, so it opens a window of opportunity for us for us to “bring God’s love to life.” When they ask why we would spend our time and resources offering this free service, it opens the doors for us to share how the love of Christ has changed our lives and could change theirs as well. Your financial support makes all this possible. Your investment in us allows us to invest in the resources necessary to make this type of community development possible. By the way, Dave’s camera was a direct investment in the ministry by one of our supporting churches. Have you ever considered supporting the ministry directly through donating camera equipment, or are you a photographer who would like to contribute some time to community development here in Cayambe? Please contact us directly if that’s something that interests you. The Catholic period of Lent is always preceded by a few days of craziness known here as Carnaval. Carnaval takes on many different forms around the world. In some parts of the world it’s known as Mardi Gras, in others, Carnival. The idea around the world is basically the same: have some fun before the seriousness of Lent. In Ecuador, it takes on the form of a huge, nationwide water fight. Since the kids have the days off from school, we invite them to the church for some organized water games. Our kids club is one of our most valuable ministries. We always provide a safe alternative for play at the church. Please pray for the kids we work with. Almost all of them are from unsaved households. Many of them live essentially on the streets or on their own all day because their parents work in the plantations. Our kids club is a shining light in their lives. Pray for their salvation and for open doors as we visit their families. Get our regular newsletter delivered straight to your inbox for up to the minute news about what's happening! Sign Up Now. Lloyd on The search is over!